No one got any sleep last night, as the constant wind made the tents flap about causing quite a racket. The four of us drove into town in the morning to check any further developments on the shipping of the transmission. It’s coming to Laayoune on Royal Air Maroc, who claims it will be here on Wednesday afternoon, based on entering the Air Waybill Number into their website. The British shipping company thinks it will be here on Monday, so we plan to hope for the best and set off back to Laayoune tomorrow. In the meantime, Witt and Graham headed off in Rafiki to spend the afternoon searching for a geographic confluence. Like geocaching, confluence visits are a new hobby spawned by the wide availability of GPS receivers. An example of a confluence is 40°00.00’N X 107°00.00’W. Check out www.confluence.org for more information on this rather bizarre pursuit. 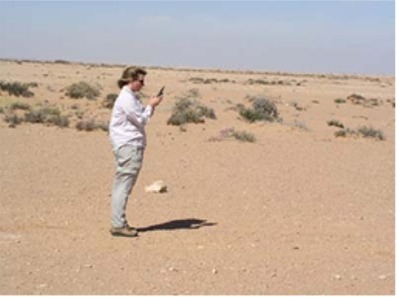 With nothing better to do with their time than search for a random point on the earth and photographing it, Witt and Graham drove about 40km through the desert, at times with no track at all, just following the GPS, in search of the confluence of 24°N by 15°W. They got to within about 25 miles of the location, but the going was slow (no one has thought to build roads to these points… I’m sure it will happen in time) and coming darkness and the desire for dinner forced them to abandon the hunt. Graham and Connie decided to sleep inside their car last night in hopes of a good night’s sleep. This morning they reported “Quiet but lumpy” while Witt and Jen in the tent experienced more “flap-flap-flap.” We set off early this morning for Laayoune, stopping for lunch of coffee and croissants in Boujdour. The drive was uneventful, and having already seen the scenery, Jen and Witt listened to some music on the way back north. We’re staying at the same campground where we stopped on our way through a week ago. Jen and Witt had their first proper showers in several days, and Jen worked to get the tent to open completely flat while Witt rotated Rafiki’s tires. 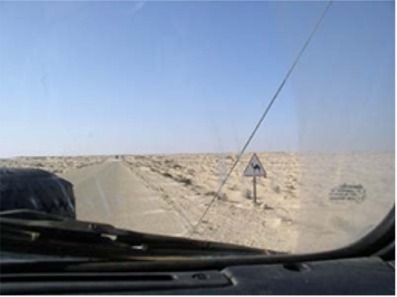 Connie and Graham drove into Laayoune to check the status of the transmission. The campground is still deserted, but the wind isn’t as bad here and we can hear the surf from the beach. We awoke this morning after a peaceful night’s sleep. The wind picked at around 8am, but we didn’t think much of it. We drove to the airport, with the expectation of being able to pick up the new transmission. We arrived on schedule at 9am. The man we were supposed to meet wasn’t there yet; he would be in “in a few minutes.” At nine thirty he arrived, but couldn’t do anything for us because the customs guy was busy. 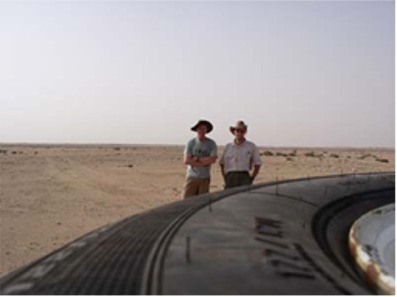 At 10 am Graham was told he would have to pay 6000 Dirhams for import duties. Graham asked if, since he was exporting the transmission, he would get the money back at the border. The guy made a few phone calls and the import duty was eventually reduced to 250 Dirhams (which would not be refunded.) Next, Graham and Witt got into the customs guy’s Mercedes and drove to the customs office in town. The office was a central waiting area (without chairs to wait in) surrounded by about 7 offices. We visited four of the offices in turn and sat while men (and in one case a woman) behind desks put stamps on various pieces of paper, copied other pieces of paper, and copied details into large books. After this was finished, Witt and Graham took a taxi back to the airport. Graham presented a heavily stamped bit of paper, and, after paying another 244 Dirhams for freight handling, we loaded the new transmission into the back of Rafiki. While all this was happening, a full-blown desert sandstorm had developed. During parts of the drive back to our camp, visibility was reduced to only 50 feet or so. 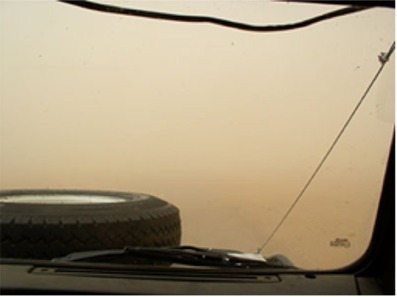 As an added benefit, driving a Land Rover is like actually being out in the sand storm, so we got to feel the full effect of grit everywhere. When we got back to camp, we discovered that the owner had used his wheelbarrow to transport all of our belongings that had been outside the car under Connie and Graham’s awning into a building. The awning has three sides and roof, the fourth side is provided by the car. The three sides zip onto the roof section, which is held in place by a metal frame attached to the car. The bottom of each side is long enough to put heavy object or sand on top of to keep the sides in place. In a strong wind, the sides probably came out from under the stuff we had on top of them, leaving the awning to flap about in the wind. The owner had unzipped the sides of the awning and left them neatly folded for us. We loaded our stuff from the building into the car, thanked the man profusely, and headed for some bungalows just down the street. The bungalow is nice but sparse, but it’s out of the wind, doesn’t flap and has hot showers (or at least a hot dribble of water, which is pretty good.) Graham in understandably frustrated to not be able to get started replacing the transmission, and we spent the afternoon watching the only channel available on the TV and playing cards. We are very much hoping for a calm day tomorrow. We were very excited to awake to clear skies and only a light breeze this morning. Witt and Graham immediately began the task of tearing apart the transmission. Briefly, this consisted of removing the floorboards, center console, and transmission tunnel, as well as the drive shafts (front and rear) and most of the exhaust system. 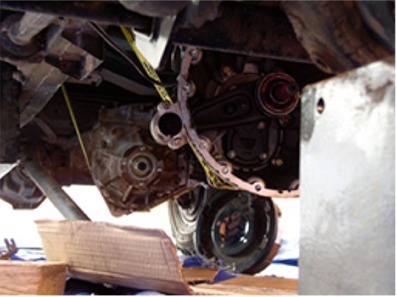 We used heavy-duty ratchet straps to lower the transmission, bell housing, and transfer case assembly to the ground. The whole thing probably weighs about 250 pounds. We dragged it out from under the car and took the bell housing, transfer case, and gear change housing off the old transmission. Graham reached into it and pulled out several broken bits of gears as well as lots of metal shavings. The input shaft to the transmission was very loose. Graham was surprised it had lasted as long as it has. We then attached the transfer case, bell housing, and gear change housing to the new transmission, adjusted the gear selector lever as per the Land Rover manual, and levered the beast back underneath the car. We then repeated the process in reverse, using the ratchet straps to lift the assembly back up into the car. Getting it aligned properly was of course very difficult, and basically amounted to wrestle-mania, Witt and Graham versus the 500-pound (yes, it got heavier as time went on) Behemoth of Inertia. We eventually got it seated and bolted in, and with darkness upon us we stowed our tools. Jen had made us a wonderful dinner, which we were not quite too tired to enjoy. Then halfway through 007’s Live and Let Die (subtitled in Arabic) we dropped into bed. Graham was very excited to retrieve broken bits from the inside of the old transmission. 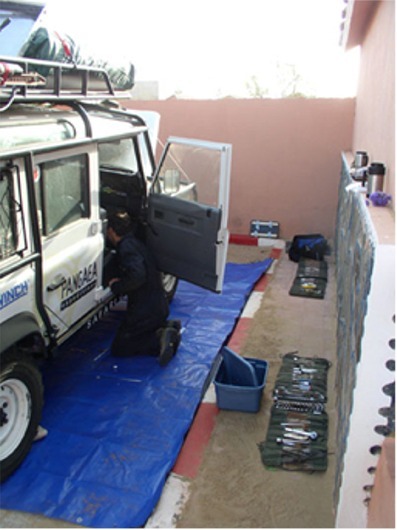 Fortunately, the local mechanics know the Land Rover R380 transmission well and are willing to help. We got up early this morning to complete the installation of the transmission, and by noon had Graham and Connie’s truck back together. This was fortunate, since today we were to complete our triumvirate of weather: Deluge of bugs (okay, not strictly weather), deluge of wind and sand, and now deluge of rain. We drove into town in the afternoon to try to send the old transmission back to the UK (Graham and Connie were charged a 350 pound “core charge” which can be refunded if the old transmission is returned.) Unfortunately no one in Laâyoune can ship something like this, and it looks like they will have to eat the core charge. It remains to be seen how we will get rid of the old transmission. We had dinner in town and are planning to leave for points south in the morning. We’re very much hoping for no more car problems for awhile! We departed Laâyoune early this morning to try to make our Saturday (the 21st) appointment with Artouro, who is to guide us through the formalities at the Mauritanian border. The drive was uneventful, and much less stressful for Graham and Connie with their new transmission. We filled our tanks and jerry cans at the last reliable fuel station in Morocco, both because fuel is more expensive in Mauritania and because we plan to turn inland and head for Choûm without stopping in Nouâdibou. We were aiming for a beach camp used by Michael and Sandy, whose website (www.expeditionoverland.com) has been very helpful to us. Navigating by GPS, we arrived at the campsite shortly after dark. 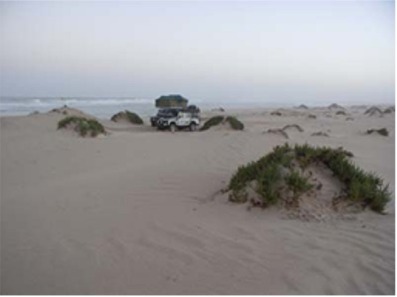 It was right at the water’s edge, and the soft sand made the going tough, but even heavily laden our vehicles made it to the campsite. Connie quickly whipped together an excellent meal of spiced couscous and we fell into bed listening to the waves crash on the beach.